The number of people who have died as a result of the terrorist attacks, on November 15 last year – in the Cathedral of the Sacred Heart, diocese of Alindao and on the refugee camp right next to it –, continues to grow. Now, it is estimated that over 80, according to information given to the international Catholic pastoral charity and pontifical charity Aid to the Church in Need (ACN). 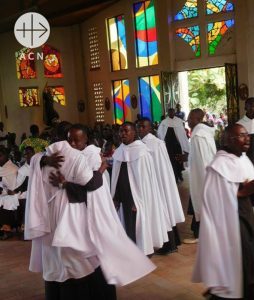 What is the reason behind this sudden upsurge in violence against Christians in the south of the Central African Republic? In the report below, the local Church analyzes the situation and explains the consequences of these terrible events. Even if they live under constant threat of attacks and they are sometimes afraid, the Monks are there to help, and vocations are on the rise! At the present time, there are over 14 different armed groups scattered across the Central African Republic. The president of the country, Faustin Touadéra, does not have the resources to control the activities of these groups, the remnants of the civil war initiated in 2013. That was dissolved into clashes between the Seleka rebels – an almost entirely Muslim coalition – and the so-called “anti-balaka”, initially a self-defence militia (a contraction of the phrase “anti-balas AK-47”, or “anti-bullet AK-47”) which ultimately degenerated into gangs of animist or nominally ‘Christian’ youths. “Organized and structured as she is, the Catholic Church plays a fundamental role in responding to the local humanitarian crisis”, this African bishop explains. The Church maintains relations with the humanitarian agencies, with the president and the UN mission MINUSCA. At the same time, however, she is an “object of covetousness” and an institution that the men of war would like to bring down. Was this the reason for the inaction of the Mauritanian UN forces during the terrorist attack on Alindao, who, “in this way smoothed the path for the attackers by not fulfilling their mission of protecting the refugee population”? Our source also provided a further piece of information, explaining that “two days before the tragedy, the leader of the UPC was received by the Mauritanian contingent.” The diocese sees this meeting as having been possibly one of “consensual planning”, or outright collusion. The leaders of the three main faith communities in the Central African Republic – Cardinal Nzapalainga, Pastor Guerekoyame Gbangou and Iman Omar Kobine Layama – have called for an investigation by the international community. ACN is proposing an emergency aid for the diocese of 60 000 dollars, to help rebuild the community, and also Mass stipends to help the local clergy in this situation of total desolation. You can give on our secure web page.